We stock a range of sizes of heavy duty adjustable levelling feet with the handling of heavy weight ratings and an ideal choice for extremely heavy equipment. These stainless steel adjustable levelling feet are ideal for heavy industrial, light industrial, commercial or workshops that are located in a wet or wash down areas. 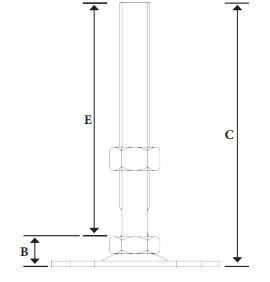 Adjustable levelling feet can solve problems with uneven floors and we often supply to businesses in the hospitality, retail, food, mining, medical, fishing, marine, manufacturing and any light or heavy commercial industry who require level structures for heavy equipment. Bolt down is available as well as various base size and shapes. 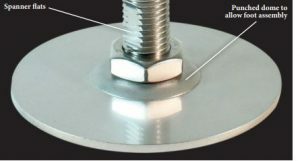 HDP is an extra heavy duty A-Justa-Foot with a fixed stud (no pivot angle), ideal for heavy machinery. The complete unit including plate, stud and locknut are all 304 stainless steel, making it perfect for wash down areas. The base is made out of 3.0mm 304 s/s plate and is laser cut to standard stock sizes. 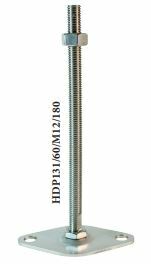 The complete HDP range is also available in bolt down (HDP 131 Series) – with a 60 base @ 10mm hole x 80mm centres , and 90 base @ 12mm hole x a 60mm centres. There is also the ability to custom laser cut base to any size or shape (depending on quantity). The stud is able to rotate by using the spanner flats machined on the stud while the base stays stationary, and once the adjustment is finished you can use the half nut supplied to lock the height in position.